I want to pass along information about a production of Sense and Sensibility, timely for us as in January we start series 11 of our Jane Austen weekends with Sense and Sensibility as the theme. The stage play is getting rave reviews and I’m hoping some of you may get to enjoy it. Here’s what Janeite Margaret Harrington has to say about the play. 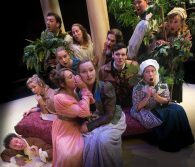 The play Sense & Sensibility by Kate Hamill now running at The Lost Nation Theater in Montpelier until October 22 is a delicious feast of a production. First it’s served up by the lively professional direction of Kathleen Keenan who has whipped up a delightful ensemble on a silver platter of wonderful acting, comic timing, emotional intensity and faithfulness to the original story in Jane Austen’s first published novel Sense & Sensibility. Then you have the brilliant scenic design for theater in the round where the designer Kim Bent uses movable tables, chairs, windows and even potted plants to transport you to Regency England in a most inventive way. The costumes by Rebecca Stewart are essentially beautiful in color and texture and with a minimalist stroke – the addition of a hat, a vest, a shawl, or a mask, the actors play multiple characters masterfully. Lighting designer David Shraffenberger illuminates all with chameleon like magic which transports you just where you want to go. The Music Design by Tim Tavcar embraces and holds you there – lost and found in Austen. The story lives in the marriage plot wherein the Dashwood sisters,Elinor and Marianne, must find husbands to lift them out of reduced circumstances brought about by the recent death of their father and the acquisition of his estate by their half brother, John. The eldest sister, Elinor, embodies Sense in dealing with her impulsive mother and two sisters and most of all her erstwhile suitor Robert Ferrers played charmingly by the actor Sam Balzac. Annie Evans plays Elinor as a complicated young woman, totally sympathetic in her role as leveling anchor in her family. Her relationship with Marianne, portrayed with depth and passion personifying Sensibility by Katelyn Manfre, is the lynchpin of the play and the scenes between the sisters are riveting, funny and moving. There are two almost vaudevillian turns that stand out and nearly stop the show. These are Mrs. John Dashwood’s reaction when she learns that her brother is engaged to a woman with no money or status. Laura Michelle Erle in the role vents her frustration hilariously. The other is the Ferrers brother played again by Sam Balzac who goes on about cottages with mindless panache that leaves you shaking with laughter. At times the actors insinuate themselves into the audience by including us in their gossip and this kind of social media chatter is what drives the plot. As a Janeite, that is a longtime enthusiast for the writings of Jane Austen, I am a board member with the Jane Austen Society of North America, Vermont region. In my opinion the play at Lost Nation Theater captures the essence of Jane Austen and reveals the power of society over individual identity with wit and levity. Behold – Jane Austen is alive and well and living in Vermont.